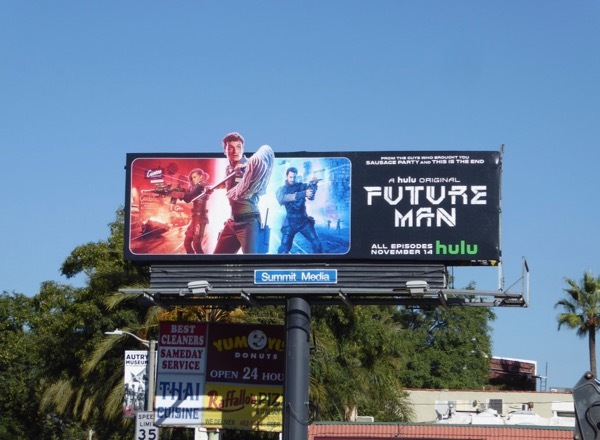 Josh Hutchinson's new sci-fi comedy on Hulu finds The Hunger Games star playing a janitor and avid gamer presented with the opportunity to save the future by traveling back to the past. 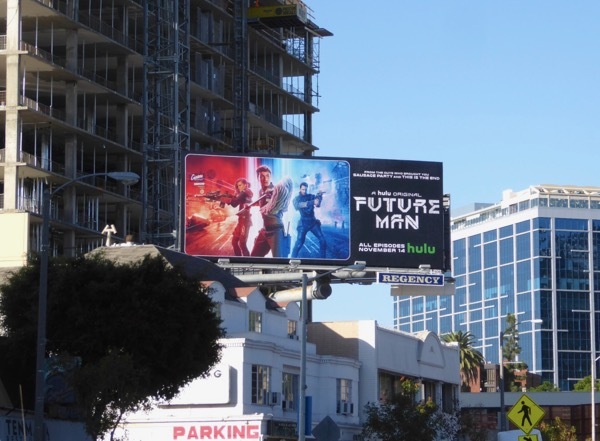 Working as a cleaner at a medical research facility trying to find a cure for herpes by day, he's drafted by visitors from the future when he conquers a video game at nighttime, and finds out it's actually a recruitment tool for the resistance in this series which feels like a mashup of The Last Starfighter, Terminator and Back to the Future (and it knows it). 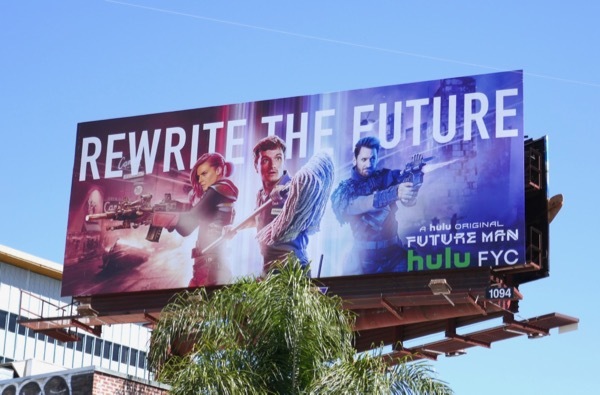 Helping him on his time-traveling adventures are battle-hardened future soldiers Eliza Coupe and Derek Wilson who take him back in time so that the person researching the cure for herpes never contracts it, and so doesn't unwittingly start the countdown to the apocalypse. 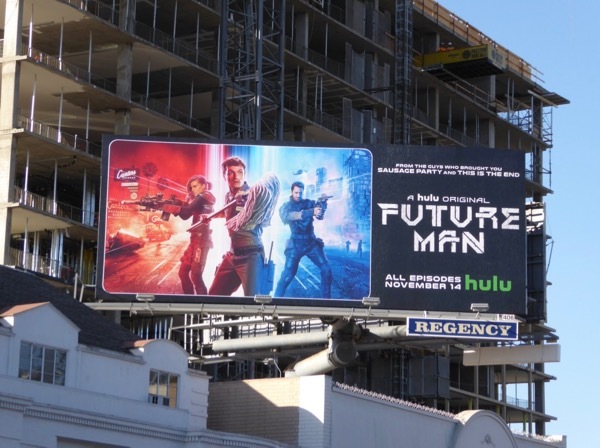 These fun special extension cut-out and standard landscape billboards were photographed along the Sunset Strip, Melrose Avenue, Santa Monica Boulevard and Pico Boulevard on November 3, 2017 and the next day. 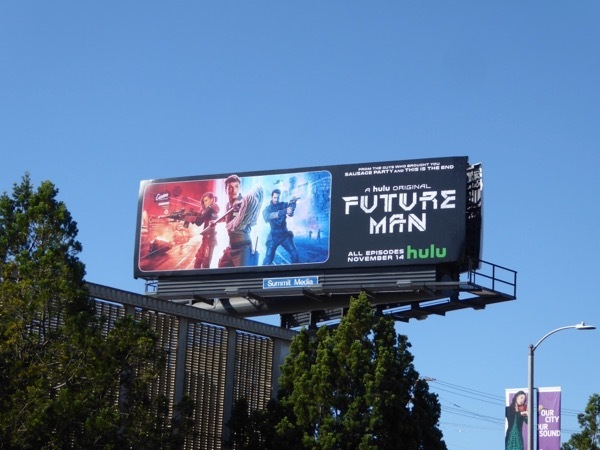 Josh Hutcherson fans can also enjoy this movie billboard for The Hunger Games. 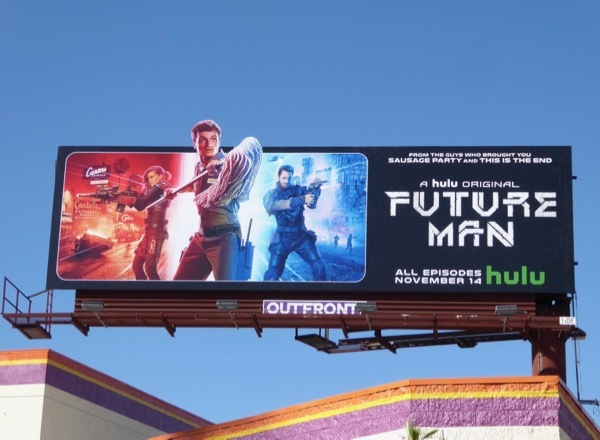 As this show is from the guys that brought you Sausage Party and This Is The End, including Seth Rogen, you can tell it's not all going to be good clean fun. As the saying goes, have janitor's mop will travel, time-travel that is. 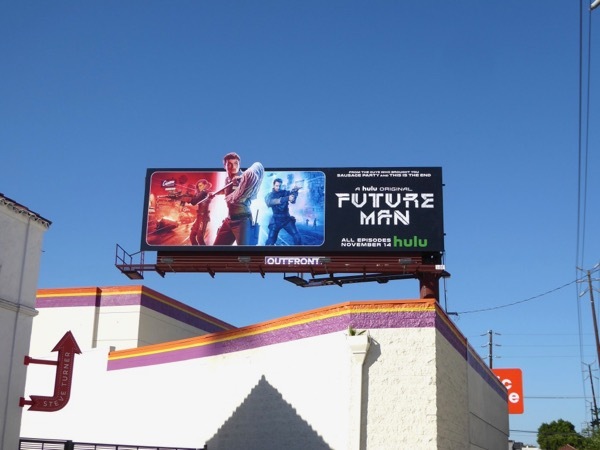 UPDATED: Here's also an Emmy consideration billboard for Future Man's first season, part of Hulu's FYC campaign, spotted above Cahuenga Boulevard on June 8, 2018.